This drawing is a replicated drawing of a historic painting by Carrvagio unless I am confusing with another painter. But in this piece I replaced the head of Christ with my own face, and I also added a hidden object in the piece. 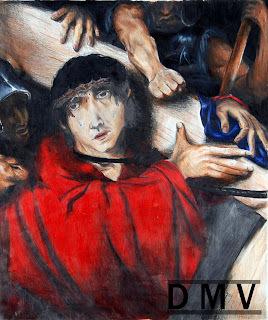 This piece was meant more to show the emotions that I would express in the place of Christ. I am an artist that is starting out in the mainstream world of being an artist. I am fascinated in the 3D animation industry and I believe that I can bring new ideas and my experience in working with art to give the general population a new look on what might be in life or in the universe that surrounds them. I also believe that 3 Dimensional art and technology will move on from being on a television to becoming a part of the real life environment. And I want to be there when the leap into the new technology takes place.